I have had to make several changes to make working at home actually work for me. Carving out writing time – In order to write consistently and meet writing deadlines, I’ve had to be very intentional about my writing time. Currently I get out of bed at 5:15 every week day morning so that I have at least 30 minutes of uninterrupted writing time before other family members get out of bed. I also try to write when my children are at school. However, I do write when they’re at home too – often when they are watching a movie or playing nearby. Putting God first – My 30 minutes of writing in the morning is preceded by time spent reading my Bible, praying, and prioritizing my day. I find that if I don’t do this first, I can go through the whole day without stopping to seek God and His guidance. Then I wonder why things go awry. 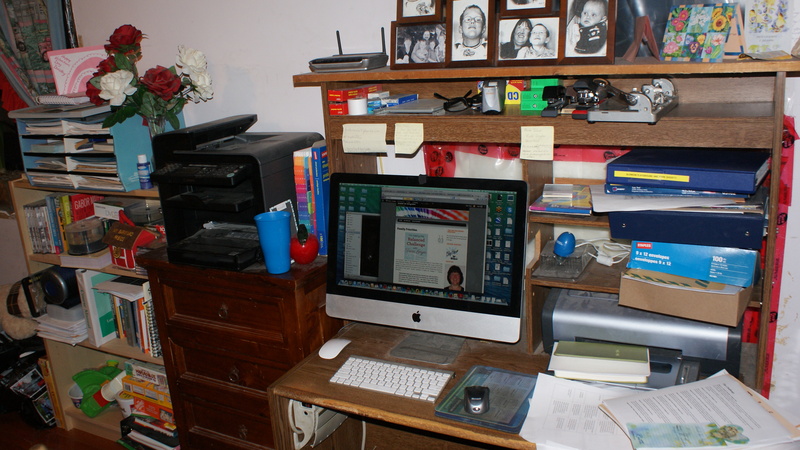 Having a dedicated writing space – the picture at the top of this post shows my current writing space. I’m thankful to be able to have my own desk, computer, printer, and bookshelf. If you look closely, there’s dust everywhere. But that’s okay. Some things have to “give” if I’m going to get my writing done. I still need to finish organizing my space, but this is a great start. Making writing a priority – I’m still working on this one. My husband and I are very different – his work is physical, whereas mine is mental. Sometimes we struggle to understand each other. It’s easy to say “no” to something else when I have a music class scheduled (I’m a piano teacher and Music for Young Children teacher as well). However, writing is often a “hidden” type of work—there’s a lot of thinking that needs to happen before any type of physical evidence can be demonstrated. I need to have the freedom to say “no” to other things so that I can write. Understanding and accepting that I’m a writer – I’m beginning to understand that most writers struggle with calling themselves writers. I’m no exception. It has taken me years to call myself a writer. I’m realizing now that writing is not just one of the many things I do. I’m called to be a writer. God gifted me with the ability to express myself in ways that make sense to other people. He expects me to use that ability. When I don’t write, I feel frustrated, like there’s something missing in my life. That’s why I need to do everything I have to do to make it happen. This is day 2 in Tricia Goyer’s Balanced Challenge. I’m looking forward to learning about changes other people have made so that they can work successfully at home. Feel free to leave me a suggestion (or two). Enjoyed this blog post. I admire your dedication. Getting up at 5:15 a.m…..wow, amazing! Obviously God has also blessed you with energy to spare. I always enjoy seeing other writers’ work spaces, so thanks for showing us yours. Who cares about dust?! It’s good to hear from you again 🙂 I do have more energy now that I’m being more disciplined about eating well and getting some exercise. Your comment about the dust made me smile. Thanks for stopping by and encouraging me. These are excellent pieces of advice, Ruth. We do, indeed, have to carve out time and of course, put God first. Ruth, I agree that spending time with God first is the only way to make sure our priorities are in order. I do find that when I spend time with Him, my mind is clearer and more focused on what I need to do for the day. Thanks for sharing this!